How old are you? In your 30s? Poor you. Still a long way to go until you finally reach your career goal: Retirement!! Sure, work gives our life meaning and purpose. But wouldn’t it be great to sleep in from Monday to Friday as well? No need to be sad on Sunday evenings anymore, because it will be weekend everyday. Dream on! Normal retirement age in the U.S. is 67. Early retirement age is 62. However, there is hope, because of the “Early Retirement Extreme” (ERE) movement. It’s a small but growing community of people who believe that retirement is already possible in their 30s. That changes the profile of the typical retiree dramatically. You could retire earlier than your dad. While you are taking care of your garden, wearing shorts and a straw hat, he will still be grinding away at the office. The idea comes from Jacob Lund Fisker. He lives in Chicago and retired at the age of 33. Another guy, Pete, retired at 30. Jacob was a physicist and Pete was a software engineer. Sure, they earned a fine living in their software engineering jobs, but they weren’t super rich investment bankers and they didn’t sell a multi-million dollar startup either. So what’s their strategy? The principles of Early Retirement Extreme is pretty easy. In fact, there is nothing magical about it. It’s very straightforward. Cut your spending and save like crazy. Once you have downsized significantly and saved enough money to be able to afford this lifestyle until you die, you can retire! Obviously, cutting expenses isn’t easy and in this case, it means cutting back substantially. Especially big expenses like housing or your car should be reduced to an absolute minimum. Ride a bicycle and you will no longer have to spend money on a car and gasoline, and you won’t need to pay for a gym membership. If you learn how to cook, you will no longer have to eat out at fancy, expensive restaurants. It’s simple math: Someone who saves 10% of their after-tax income needs to work nine years in order to finance one year of retirement. On the other hand, someone who can save 90% of their income needs to work one year to finance nine years without work. Sure, saving 90% of your income is quite challenging and probably not realistic for most people, but I guess you get my point. I know what you’re thinking. You imagine Jacob and Pete being some kind of alternative hippies, living in a tent and eating carrots and kohlrabi all day long. I was thinking exactly the same. But actually, their idea is quite down-to-earth. You don’t need that much money to be happy. Traditionally, people think about retirement as a time where they can enjoy all the money they earned in their life. Therefore, they try to accumulate as much as possible in order to do everything they want once they are old. The ERE movement shifts the focus from money to another resource: time. If you can downsize your needs, income from sources other than work will be sufficient. If you have enough money to finance a frugal lifestyle, you can enjoy your time. An important point is to invest your savings. Clever investments will increase your future income stream. Invest your money in stocks (usually considered the highest return-yielding asset) and bonds, mutual funds, ETFs, whatever you feel comfortable with and provides you with a high, rather safe in the long run, return. Obviously, this approach will not work for everyone. But if you are curious about it, feel free to give it a try. Manage your personal finance and live your life for a few months as a minimalist of sort. If you can imagine continuing like this for the rest of your life, chances are good that you can retire earlier than 67. Maybe much earlier!!! FUNanc!al is a non-commercial community, which connects financial education and FUN. Our goal is to make our audience smile and to provide valuable information to investors. The website offers published articles about current topics, funny quotes and lots of interesting information. Visit our page www.funanc1al.com and take a look by yourself! Great post! 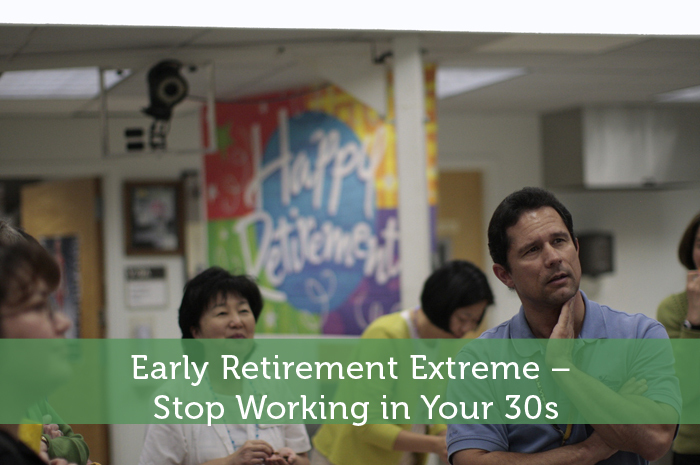 It seems amazing idea about Early Retirement Extreme – Stop Working in Your 30s. Many will be happy to see this post. Thanks for sharing. Highly unrealistic plan for almost 99.99% of all the readers. Even if you save and you don’t make it by your target age, you’re still doing the wise thing because we all get hit by unexpected circumstances and it’s good to have savings to cushion the blow. That’s what happened to me. It’s very helpful post. Great! For me, the idea of retiring in my 30’s is too extreme, But the idea behind it is great – live well below your means and save as much as you can. You can go without a lot of the “Stuff” we think we need to have. Figure out what matters most to you and cut the rest and save the difference. Retiring at the age of 30 years is great! But, I would still continue working and work on my retirement fund to boost to reach its maximum potential so that I can have a great retirement years! Retire in my 30’s!? I’m the active type so any type of early retirement would just be a quick break till I found something new to do! I would make sure I’m having a lot of fun doing whatever it is.